eFX's second clone trooper helmet, this time weathered arrived with the same excellent packing and included parts as the shiny white trooper helmet that preceeded it. Since this is really the same helmet as before, but with a different finish, red trim paint and a chome see-through visor, details are the same. It's still heavy, being very solidly built. Unlike the gloss white of the first one, this is completely matte finished with weathering very lightly applied. It looks good, as though it has seen its first battle, not an entire war. The "mohawk" light is still there and works the same way as before. 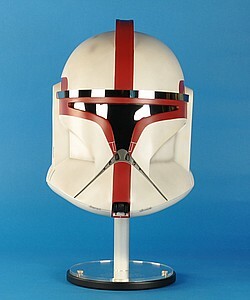 If you are collecting helmets, this one needs to be added to your collection. • 50 Made Available Outside US by eFX. Email redclone@efxcollectibles.com to purchase.